Magic lantern slide for the 1921 Lambert Hillyer film, "The Whistle," produced by its star, William S. Hart. Just as his earlier stage career took him from Shakespeare to the American West, William S. Hart's film career wasn't limited to portrayals of cowboys. Labor unrest was capturing national headlines after World War I as more and more workers organized, and Hart jumped into the fray feet-first with "The Whistle" (as in a factory whistle). Hart portrays an industrial laborer in New England who avenges his son's death in a workplace accident that resulted from a greedy factory owner's refusal to implement costly safety measures. 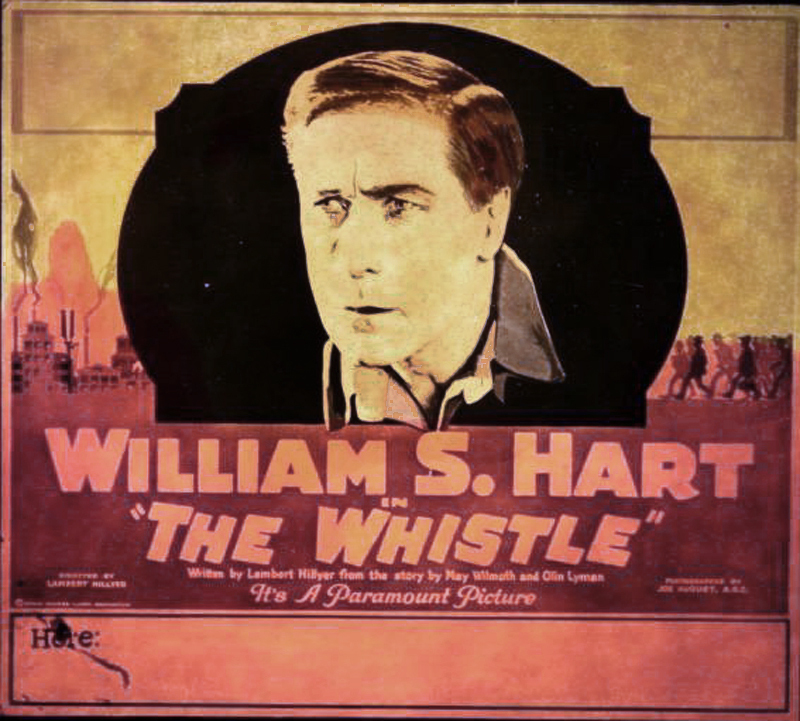 Despite critical acclaim (see below), "The Whistle" wasn't the sort of fare Hart's fans were used to, and the picture failed at the box office (Davis 2003:150). It was even banned in some states because of the controversial subject matter (Koszarski (1980:131). Produced by the William S. Hart Company; distributed by Paramount-Artcraft; New York premiere March 27, 1921; released April 23, 1921; ©February 4, 1921; six reels (5,359 feet). Directed by Lambert Hillyer; screenplay by Lambert Hillyer from a story by May Wilmoth and Olin Lyman; photographed by Joe August; art director, J.C. Hoffner; art titles by Harry Barndollar. Print sources: LC; Blackhawk; Em Gee. CAST: William S. Hart (Robert Evans); Myrtle Stedman (Mrs. Chapple); Frank Brownlee (Harry Chapple); George Stone (George Chapple); Will Jim Hatton (Danny Evans); Richard Headrick (Baby Chapple); Robert Kortman (Scardon). FH2101: 9600dpi jpeg from scan of magic lantern slide in Hart Museum collection.